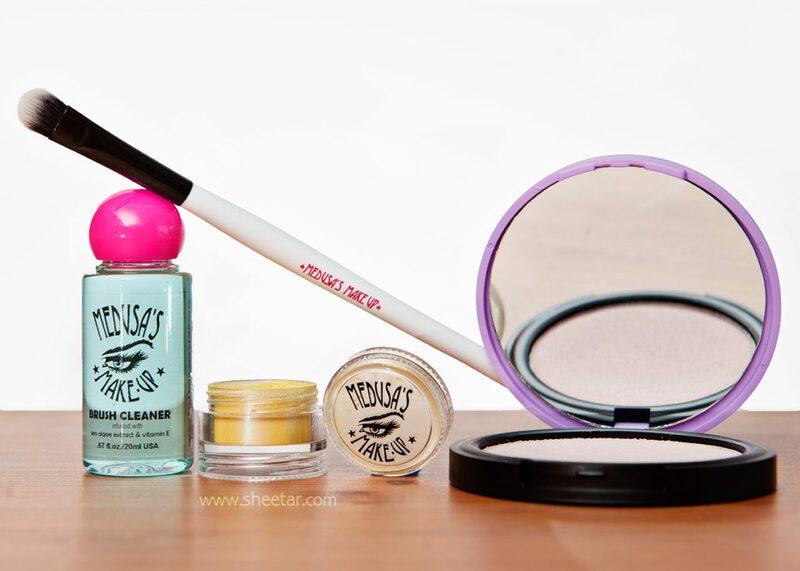 This is a new subscription from Medusa’s Makeup featuring items from their own line. The first ever shipment was last month, but I missed that one, so here’s the second one! The shipment arrives in a metallic bubble mailer (mine was gold) and has minimal packaging which is a total win for me – I’d rather receive more product and less packaging, plus it’s less waste/recycling which is great. Everything Medusa’s Makeup makes is Cruelty-Free and most items are vegan too which is right up my alley. This arrived on September 22, but I’m just getting around to posting about it today. Eye Dust – 1.5 g / $7 – (Product is Full Size) This is a shimmery yellow eye pigment in the color, “Lemonade,” that goes on pretty sheer but looks like it’s buildable. It’s pretty perfect for a little highlight on the inner eye corners or for a shimmery dusting under the brows. It’s not a color I’d have picked out for myself, but I think I’m going to have fun figuring out how to make it work. The container is an open container, no sifter, but it’s filled to the absolute top with product. Brush Cleaner – 20 mL / $8 – (Product is Full Size) Another vegan product infused with algae extract and vitamin E. It smells pleasantly fresh but not heavily perfumed, and while it doesn’t foam much, it clearly works great and rinses out cleanly. The bottle top has a narrow squeeze bottle opening so it’s easy to get just enough cleaner out for one brush and not end up with a huge glob. Shadow Brush – 4 pack / $24 – (Single brush, value of $6) It’s a synthetic brush, so it’s vegan. It’s a little bigger than some of the other eyeshadow brushes I use, but you can never have too many brushes on hand. I think having one that’s between a blending size brush and a smaller eyeshadow brush will be helpful. Body Shimmer – 10 g / $12 – (Product is Full Size) The shade I received is, “Healthy,” which is pink toned with a gold shimmer. This is a pretty subtle shimmer and would work perfectly as a highlighter. The pink tone actually looks great on my skin, and I’m digging this more than I thought I would! I’m usually not all that big into highlighter or shimmer type products, but this is really rather nice. Overall the value comes to $33 which covers the subscription price of $15.95 although it’s less than the advertised value of $40. The value is still over double the cost and I’ll use everything, so I consider that a win! Plus, the colors and products got me a little outside of my comfort zone which is great. I like being pushed to try new colors, especially ones I wouldn’t have considered picking for myself. I like this enough that I’m in for another month!